The Ellora Jain Cave Basadi are a fine example of the Jain legacy and heritage in India. The word Basadi means a shrine or temple belonging to the Jain faith that is widely used in Maharashtra. The Ellora caves are found in the city of Aurangabad and are recognized as a UNESCO World Heritage Site, numbering 34 caves in all. These exemplary caves are a timeless testament to the craftsmanship. 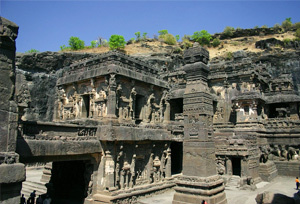 The Ellora Jain Caves are five in number and are numbered from30 to 34. These caves are separated from the other caves by a distance of a few hundred yards. There are two main caves and two unfinished caves among the five. These caves date back to the 9th and 10th centuries and belong to the Jain sect called Digambara. Cave 30 is called Chhota Kailash; cave 31 is an unfinished cave; cave 32 is called the Indra Sabha; cave 33 is the Jagannath Sabha, and cave 34 is a smaller cave that connects to an opening in cave 33. These caves also contain a hall called the Samavasarana, which is a hall where the Tirthankara used to preach the followers. All the caves have sculptures and once had vibrant paintings on the ceilings as well, some of which can still be seen. There are prominent sculptures of the 23rd Tirthankara, Parsvanatha, as well as the last and 24th Tirthankara, Mahavira. There are also 48 sculptures of Yakshas and Yakshinis who were considered the teachers of the Tirthankaras. Also of note is the statue of Bahubali, also called Gomateshwara, who was the son of the first Tirthankara.